Some countries have been drinking wine since as early as 6000 BCE (Georgia with the ancient booze cred), and others are only just beginning to enjoy it. 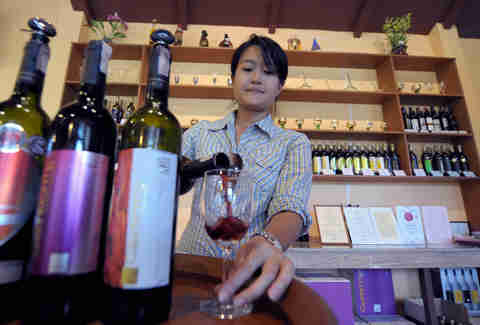 To much of Asia, for instance, the availability of grape wine is one of the spoils of a globalized market. But while wine is had all over the world, it's not always in the same way. Whether out of leather bladders or literally #blessed, here’s how different countries consume their wine. Some of these methods go beyond the bottle. The French hold wine in such high regard that oenological studies begin on day one. In the Northwest region of Champagne, parents are known to give their newborn child a pinky of their eponymous bubbly stuff before they ever even taste breast milk. From a young age, children sip wine with dinner, so by the time they reach 16, these French kids know their Burgundys from their Bordeauxs and can walk circles around your sorry ‘goes to Napa once’ self. The Spanish are partial to sparkling wine, though not in the way you might imagine. Although they have their own version of a white grape frizzante, known as Cava, they are also known to forego CO2-ing the wine itself, and mixing in ‘gaseosa’ (soda) to a bottle of red. You can call this concoction “tinto de verano” or “kalimotxo,” depending on whether it uses a lemon-lime soda like Sprite or Fresca, or a cola-based soda, respectively. Kalimotxo is a newer tradition, enjoyed predominantly in Basque country by the young and broke. It wouldn’t be out of the norm to find a group of teenagers drinking a mixture of cheap red wine and a 2 liter of Coca Cola out of a plastic bag. A more typical way to serve the cocktail and other wines, would be out of a porron. 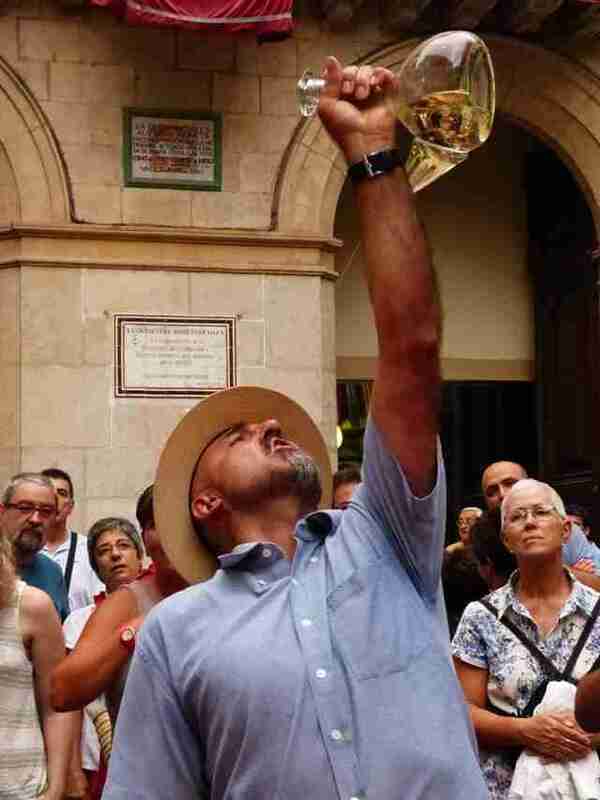 A porron is essentially a glass booze bong, whose side spigot can be poured directly into your mouth. It is a point of pride to be able to hold the porron as far away as possible… or at least farther than the last guy. Other receptacles the Spanish enjoy their wine from are the botijo, an urn-like jug with one or more openings, and the bota de vino, a comma-shaped bladder usually made of leather. 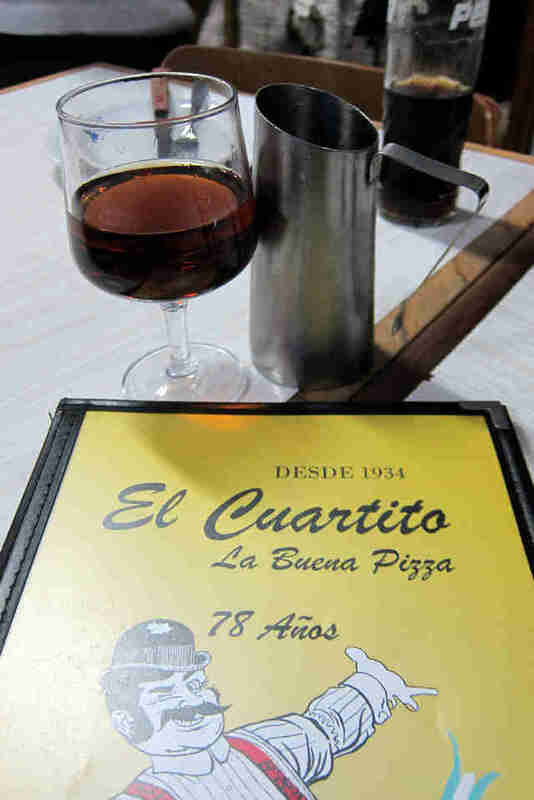 “Tinto de Verano,” which translates to ‘Summer red wine,’ is relished by youths in the rest of the country, most frequently throughout the hottest months. 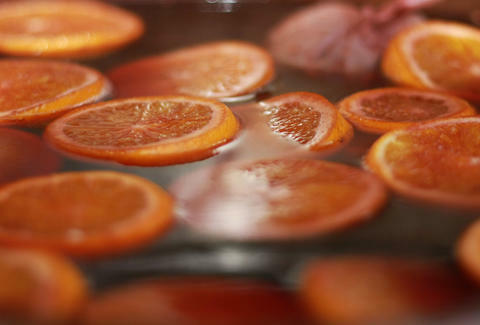 It’s considered the poor man’s (or perhaps a more to-the-point) version of one of Spain’s most exported wine traditions -- sangria. In Georgia, a country known for its strong, ancient wine varietals, your glass of grapes is likely to be accompanied by round after round of elaborate, ceaseless toasts. Formal feasts and drinking events, like weddings, are hosted by official toastmasters known as Tamadas. This person is a leader in the community, possesses great rhetoric skills, and can drink you under the table, where you’ll no doubt end up after cheer number eighty-three. To the delight of Viennese drinkers and WASPy stateside mom cliques alike, in Austria, a carafe of white wine on your dinner table is likely presented alongside a siphon seltzer bottle, essentially an ornate SodaStream from 1800s. 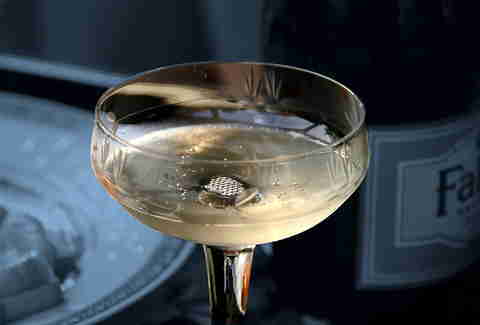 Glasses (which can be a cylindrical highball glass or a stemmed wine glass) are filled about two thirds of the way up with Austrian white and topped off with a splash of fizzy H2O. But if it's cold outside? 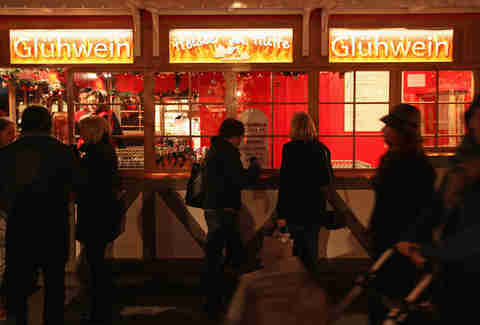 Ditch the spritz, this is a time for gluhwein. That translates roughly to glow-wine, which refers to the orange glow of furnace-heated rods that used to be used in mulling. This popular winter drink is a mix of warm red wine and spices, including cinnamon sticks, cloves, star aniseed, and citrus. Variations may include vanilla beans or a shot of rum. Although Israeli wine ≠ kosher wine, the two tend to overlap in a big way. To be considered kosher, a wine must be produced with the oversight of a Sabbath-observant Jew, include kosher-approved ingredients, and receive a seal of kosher certification by an agency, rabbi, or a beth din, a Jewish court of law. 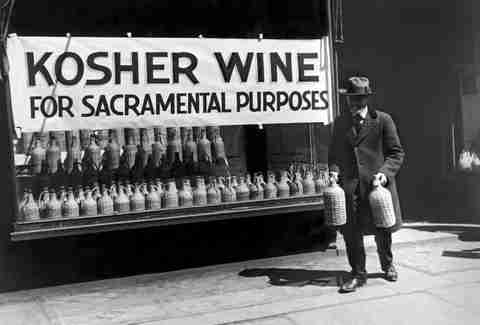 One concern surrounding kosher wines is the requirement that they not be used in circumstances outside of the Jewish faith, or in idolatry. A loophole solution that has been developed for this issue is to boil the wine and turn it into meshuval wine, which makes it impermeable to idolatrous use. Although no record of this claim can be found in any religious scripts, it’s become a popular crutch to lean on when drinking wine in a casual setting. Very clever, guys. This should come as no surprise to anyone, seeing as how Canada is 99% inhabitable frozen wasteland and 1% poutine and pop music. While this is a huge disappointment for anyone who’d like to go to a mid-Winter foodie festival in Northern Ontario, it’s great news for anyone with a vineyard. 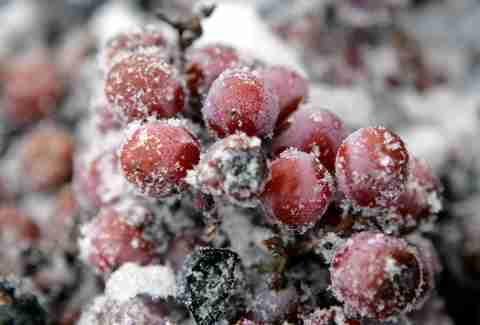 Icewine is made from grapes that have frozen on the vine, which are then pressed into a dessert wine. And we think that’s pretty sweet. Unlike the French, though, or the export markets who fetishize French vintages, wine is not considered a vehicle through which to flaunt wealth. Wine is the everyman’s drink, and lowbrow pairings like pizza and moscato are often promoted and sold together. And the interest in viticulture is being furthered by storytelling. According to the beverage manager at the Ritz-Carlton Seoul, “brands gain traction in Korea on the back of great tales.” For instance, a particular 1865 vintage from San Perdo, Chile, is said to get your golf game up to a 65 (for those a little rusty on their golf knowledge, this is a good thing.) 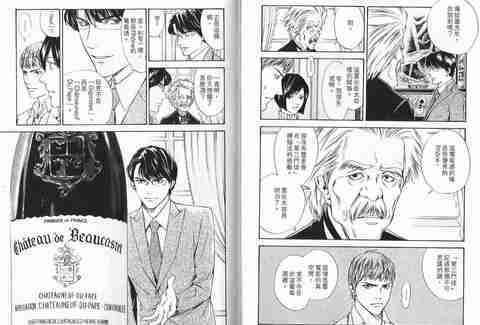 Another narrative chugging the scene along is a Japanese manga series called “Drops of God,” which features real wines from around the world. Barleywine Is the Best Winter Beer. Here's Why. Every night is a corkage-fee-free night in Thailand, where wine consumption goes hand-in-hand with BYOB culture. Consumers have direct relationships with retailers, who use elaborate courier services to deliver bottles from the customer’s private locker directly to the restaurant where they are dining. It’s like Uber for wine! 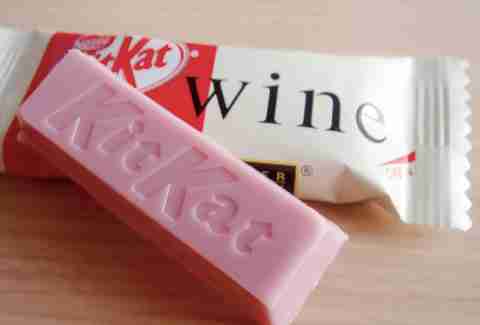 The Japanese eat their wine in Kit Kats! Of course, they drink it too, but this is by far the most Japanese way to get a grape fix, so it’s the one we’re geeking out over. Laura Reilly is a Production Assistant at Thrillist and will drink wine any way you serve it to her. See her tweets several glasses deep at @asapreilly.